Our nation stands at the precipice. The Left has made unprecedented assaults on the rule of law, the integrity of elections, the first amendment, the second amendment, our religious liberties, our education, our culture and our national security. It literally threatens our very way of life. Nothing captures this reality more than illegal immigration. Illegal aliens bring crime, disease, unemployment, epidemic vote fraud and the prospect of terrorism. They swamp our legal system, hospitals and welfare with overwhelming needs, while arrogantly demanding more. Illegals facilitate the drug epidemic, and commit murder and other crimes out of proportion to their numbers. Neighborhoods and schools degenerate while beleaguered taxpayers are forced to shell out to cover the exploding costs. The big business of cross-border human trafficking also facilitates the illegal entry of terrorists from al Qaeda, ISIS, Hezbollah and others, a growing threat from Central and South America where terrorists have set up shop. Despite the overwhelming problems and blatant defiance of our laws, almost all Democrat politicians and some Republicans actually encourage illegal aliens. Republicans falsely claim that there aren't enough Americans workers to fill factories. Democrats cynically use the immigration system, legal and illegal, for the specific purpose of increasing their voting bloc, while calling us all "bigots" if we object to their scam. "If Democrats don’t try to do everything in their power to defend Dreamers, that will jeopardize Democrats’ electoral chances in 2018 and beyond. In short, the next few weeks will tell us a lot about the Democratic Party and its long-term electoral prospects." The "Dreamers" of course are the illegal aliens that Democrats (and some really stupid Republicans) want to reward with the Development, Relief, and Education for Alien Minors Act (aka DREAM Act), granting them amnesty, education subsidies and a laundry list of other taxpayer-funded bennies. Right now we face a critical issue that requires immediate action. On January 19, the president must sign a budget bill to keep the government from shutting down. Both Congress and the president want to reach a deal on DACA - the Deferred Action for Childhood Arrivals program. Somehow, they hope to include this in whatever budget deal they work out. DACA was one of President Obama's more outrageous - and illegal - actions; regulatory amnesty. It gave illegal alien youths who arrived in the U.S. before 2007 (but how does anyone verify that? ), temporary legal status, i.e. action on their illegal status was deferred. They are referred to as "kids" but almost all are over 19 and half are 25 to 35. This group is a subset of the so-called "dreamers." There are about 800,000 illegals signed up in the program, of 1.76 million or more who could quality. They are characterized as "victims" because their families brought them here before they were old enough to decide for themselves. Their families - also illegal - are still here. This rarely gets mentioned. If they are "victims," why aren't their families responsible? Why can't their families take them back? If these DACA "kids" are amnestied, their families would become eligible as well. The numbers would then swell to as many as 5 million. It would be the largest amnesty in U.S. history. The Democrats want to amnesty all 1.76 million, that is, all the "Dreamers." And that is a very conservative estimate. If this is approved, their families go on the short list, and the total amnesty could be even larger. Such an amnesty would change voting patterns permanently and would spell the end of our Republic as we know it. In fact, a recent analysis shows that amnesty for even just the original 800,000 could swing elections in 4 critical states and accomplish the same thing. Candidate Donald Trump promised to end DACA on his first day in office. Instead he has equivocated. He ended the program in September, but gave Congress until March to come up with a legislative "fix." Now he's negotiating with Congress to include this fix in the January 19 budget deal. Amnesty makes a mockery of our rule-of-law. We should not have to be lobbying Congress and the President to do their jobs by enforcing the law and securing our borders. Mark Levin has called Trump's move toward border compromise a "complete surrender." However, today, Trump pushed back against a proposal by a new bipartisan "group of six" Democrats and RINOs -- the usual suspects -- that defies his basic demands. He is not budging. So our messaging to President Trump should encourage him to keep the faith rather than pillory him. 2. Send them ALL home! 5. End birthright citizenship (i.e. anchor babies), and birth tourism. 10. No special treatment for Central/South American illegal alien youths - currently able to appeal for asylum, while Mexican illegals can be sent home immediately. Reps. Bob Goodlatte (R-VA), Michael McCaul R-TX), Raul Labrador (R-ID) and Martha McSally R-AZ), have proposed a new border control bill. HR-4760. DC insiders believe this is the best deal that could possibly be made on this issue. NumbersUSA supports this bill, saying it "greatly reduces overall immigration." "the bill's authors expect many of them to eventually obtain a green card through an employer or by marrying a U.S. citizen. I think we should expect that all or most of the recipients of any DACA amnesty will eventually have a path to citizenship." This means families could get citizenship too; another 2 - 5 million. I leave it to you to decide which path this legislation will probably take. As we have said, there is no reason we should have to be negotiating about illegal aliens. They broke the law. Period. Step 1: Watch, understand and utilize Laura Ingraham's important broadcast last night on this subject. But keep in mind, Trump has already betrayed us on Amnesty, it is no longer a question of "if Trump does this." This video needs to be seen by as many Americans as you can show it to fast! Watch then share by email and social media. "I am livid that your focus is passing DACA & Comprehensive Amnesty for illegal aliens for enforcement promises we can't trust! Americans should not be forced to trade Amnesty for secure borders. I want to see all Republicans face primary opponents over this betrayal on DACA!" Please start with the Republican members of the House and Senate in your state and then expand outward to nearby states. CALL then WRITE as many as you can quickly! Click HERE for an Interactive U.S. map, Choose your state and look up your member of Congress. Click HERE to see where your Senators stand. Click HERE to reach Heritage Action's interactive toolkit. Includes sample tweets, letters, phone scripts and graphics used for effective communications to elected officials and the press. Click HERE for this easy to use tool from the League of Women Voters. It allows you to find your legislators, from the President and U.S. Senate on down to local councils. Simply enter your zip code. Zip code plus four not necessary. Click HERE to read this viral article about the best way to get your legislators' attention. GOP suicide pact: DACA amnesty could flip 4 critical GOP states. Amnesty = 5 million New Americans: GOP plan is not amnesty, but would make future amnesty more likely. Democrats will push for it nonstop. DACA Amnesty will cost $26 billion: Advocates claim DACA employees with boost IRS tax revenues. This is false. Families WILL NOT be separated: Pro-amnesty groups whine that if DACA "kids" don't get amnesty, the DACA families will be ripped apart. How so? Illegal alien parents and children are all here now. Parents need to take their kids home. If the "kids" came here alone, sending them back will reunite them with their families! So no one is being ripped from their family! Illegal aliens take American jobs. Amnesty just makes it legal - rewarding both aliens and businesses that hire them. 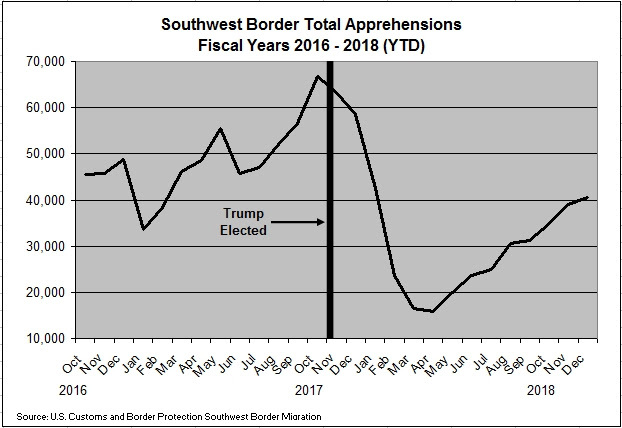 Illegal border crossings skyrocket: Illegal border crossings plummeted to historic lows early in President Trump's first year as shown in the chart below. Now they are up again, based on the perception that Trump is softening on border control. DACA amnesty will open the floodgates: encouraging even greater illegal border entry. Illegal alien gangs. Almost 30 percent of illegal alien youths crossing the border have ties to MS-13, the most violent street gang in the United States. Illegal aliens lie about age. Many who claim to be under age are not, and game the system by lying to get in. 4.5 million anchor babies 18 or under in the U.S. exceed annual birthrate of Americans. Five years of chain migration exceeds annual U.S. birthrate. This is a critical issue and it may be our last opportunity to get real border reforms. We should all make this our number one priority every day from now until January 19. Bury them with your demands!